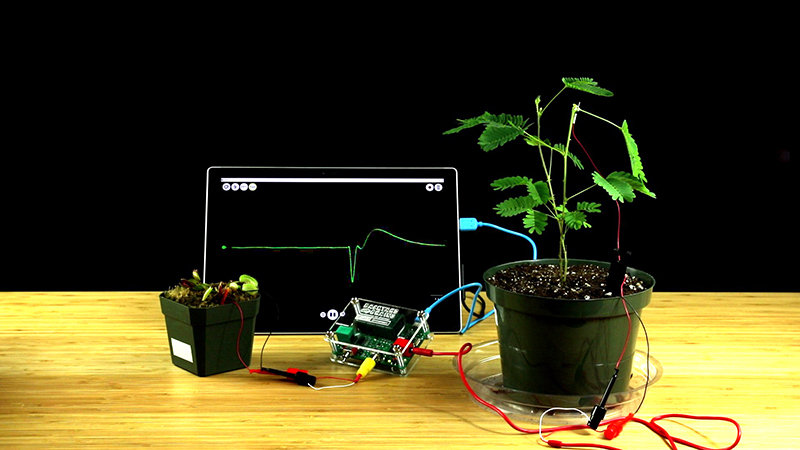 In this experiment, featured on the TED Main Stage, you will learn about plant electrophysiology and record the action potential of the Venus fly trap. 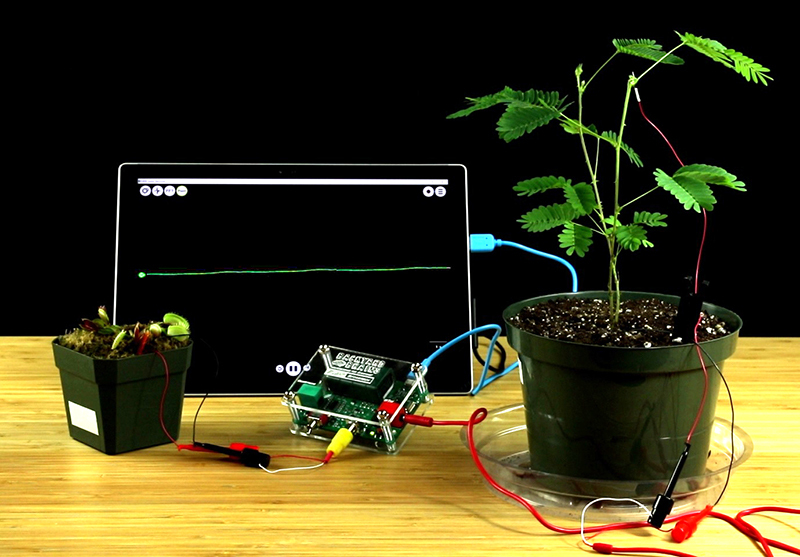 The Interspecies Plant-Plant-Communicator is an experiment unlike any other. Before you begin, we recommend familiarizing yourself with the Venus Flytrap and Sensitive Mimosa experiments. These two plants exhibit very striking and quick behaviors that begin to blur the lines between "thinking" and "unthinking" life, and it can be an uncanny experience when you see the movements of these plants for the first time. To be clear, all provocations aside, plants don't have brains or neurons. There is no evidence that they think or feel. They're not worried about how far up they are on Mazlowe's hierarchy, they don't get stressed out over elections, and they certainly don't care about baseball. A plant's "movement" is strictly the result of biologically advantageous evolution. Still, they share a similarity with us and with other living, "thinking," creatures, which is fascinating; that is, they harness the power of Action Potentials! We can see Action Potentials as a universal currency of movement. It is the signal of stimulation and the birth of behavior. To distil this phenomena down to a basic biological circuit, we present the Plant-Plant-Communicator, the experiment wherein, simply, one Action Potential will trigger another, but more fantastically, the behavior of one plant will control the next! This experiment was designed for our Plant Electrophysiology TED talk which we gave in early 2017. Check out the TED talk below, then perform the experiment yourself! In this experiment, we are going to open up a line of communication between two plants of different species! We will trigger an Action Potential in a Venus Flytrap, then send that signal to a Sensitive Mimosa, causing it to react to the stimulus and drop its branch. Begin by selecting your Venus Flytrap and Sensitive Mimosa subjects. Try to pick two, healthy, large plants. Organize your Flytrap cables: Yellow RCA Jack with electrode clips, one short black wire with grounding pin, one orange stake recording electrode. 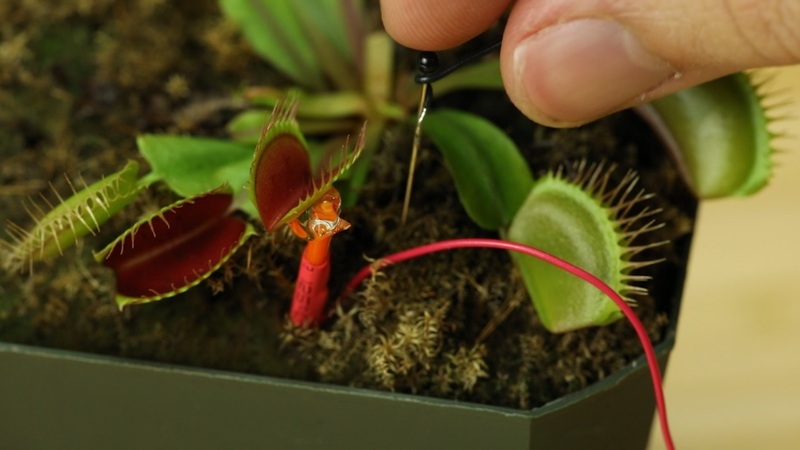 Take the orange electrode stake and plant it firmly into the ground so that the silver electrode wire is touching, or is nearly touching, the side of the Venus Flytrap. Apply conductive gel where the electrode meets the plant wall to complete the connection. Place your Venus Flytrap near your Plant SpikerBox and plug in the yellow RCA jack electrode. Then, take the clips from the RCA jack and attach the red clip to the red wire (the recording electrode on the stake) and the black clip to the black wire (the grounding pin). Organize your Mimosa cables: Stim Cable (long red cable with clips), one long black wire with grounding pin, one long red wire with silver wire tip. Take the black wire grounding pin and stick it in the dirt near the Mimosa's stem. Take the red wire with the silver tip and carefully, and tightly, wrap the silver tip once around a large Mimosa branch. Try to wrap it close to the stem. This will probably cause the branch to "fall" as you fumble to wrap the electrode. That's okay, you just have to wait 10-20m for it to reset before performing the experiment. 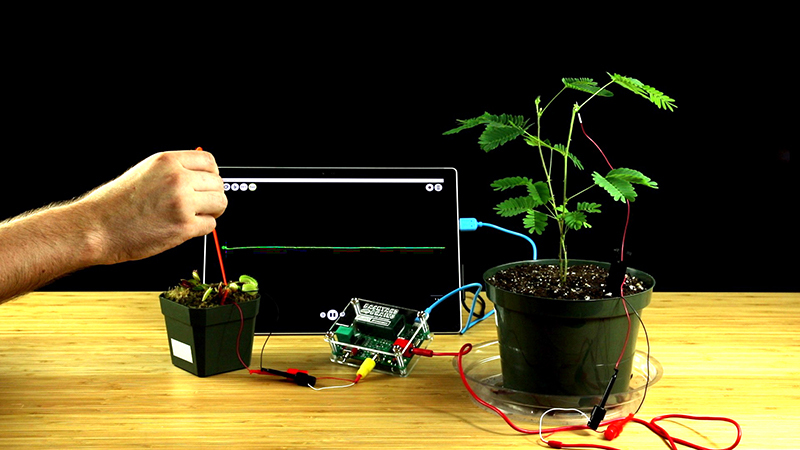 Apply a dab of conductive gel where the wrapped electrode meets the plant. Plug the red stimulation cable into the Plant SpikerBox and, pay attention here: Attach the BLACK clip to the RED cable and the RED clip to the BLACK cable. Once you've followed these directions, and doubled checked steps 12 and 13, turn on your Plant SpikerBox! If you want to record the trigger, plug your Plant SpikerBox into either a smartphone or PC which has the Backyard Brains SpikeRecorder software installed. Look for the red "Enable!" button near the front facing side of the Plant SpikerBox. Press the button and look for the red LED beside it. The LED should begin blinking. The blinking indicates that the experiment is armed and ready to go! Finally, carefully stimulate just one of the trigger hairs in the Venus Flytrap and behold! The stimulation cable should carry the Action Potential across from the Venus Flytrap and the Sensitive Mimosa will dramatically react, drooping and appearing to wither up! This is the beauty of the Interspecies Plant-Plant-Communicator! 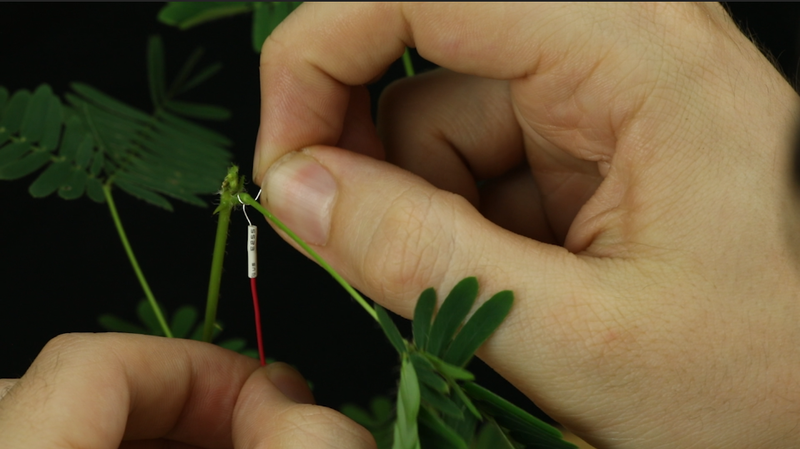 If an action potential fires, but it doesn't drop the branch, try swapping out for a fresh battery, moving the ground pin closer to the stem of the Mimosa, or adjusting the silver wire electrode's positioning or the amount of conductive gel on the branch. Do you think you could reverse this circuit? How would you prep it? Try it out! What have you learned about how plants are similar to ourselves? And how are they different? Think about this interface as an electrical circuit, what is actually happening here? 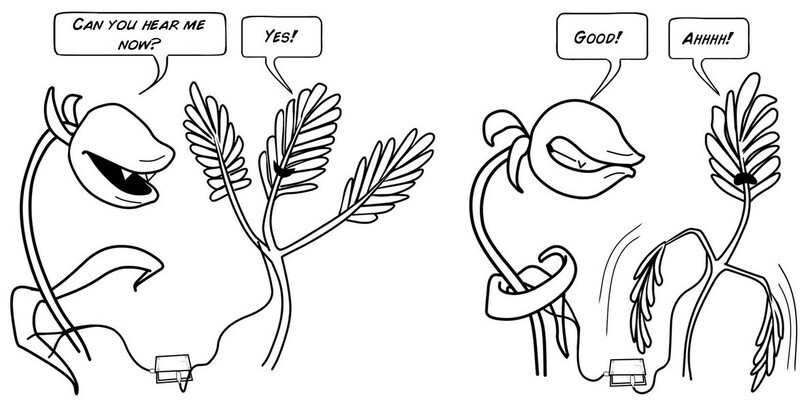 Could you come up with a way to send a signal to a plant with your muscles?